"Why do you seek the living among the dead?" These words of the angel to the women who came to Jesus' tomb are also God's words to us. Jesus is risen! 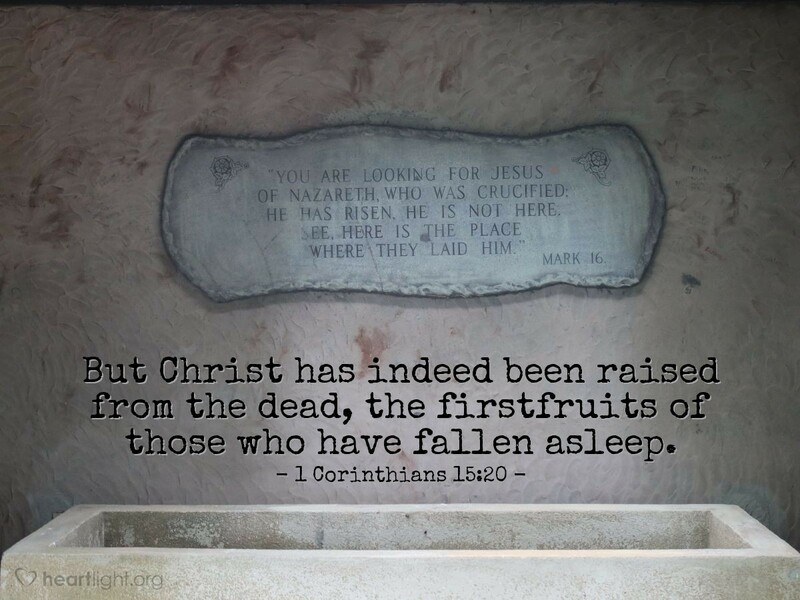 Not only that, he is the firstfruits from the dead. He is the guarantee that God's harvest will happen; he is our assurance that we, too, will be raised. Death no longer has a hold on us! We are God's eternal children and death cannot separate us from his presence or his love! Father God, I praise you for your redeeming grace. I rejoice in your conquest over Satan and over his power to wound and destroy through death. I thank you for your power over the grave. Thank you for raising Jesus from the dead and giving me the assurance of life forever with you. Please bless me, dear Father, with a life that reflects the power that you have now working in me. In Jesus' name I pray. Amen.